Surf’s up! 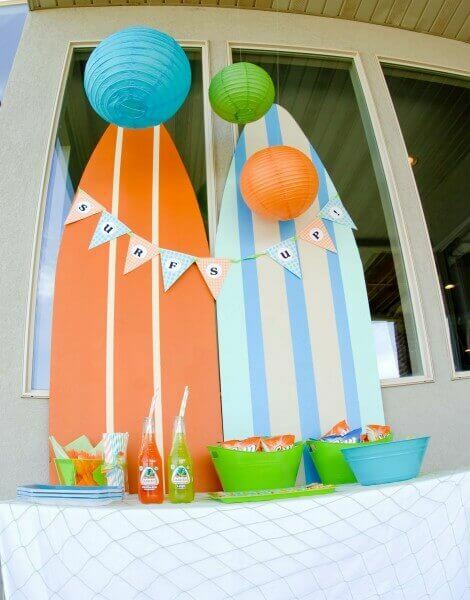 Catch a wave and ride with us through the details of this amazing summer surfing party! Holly, of My Paper Crush, threw this party for her son and his friends to celebrate the end of school/beginning of summer, but it would work well for any kind of party. The bright color palette included sunny shades of orange and yellow which popped next to the perfect hues of lime green and aqua. 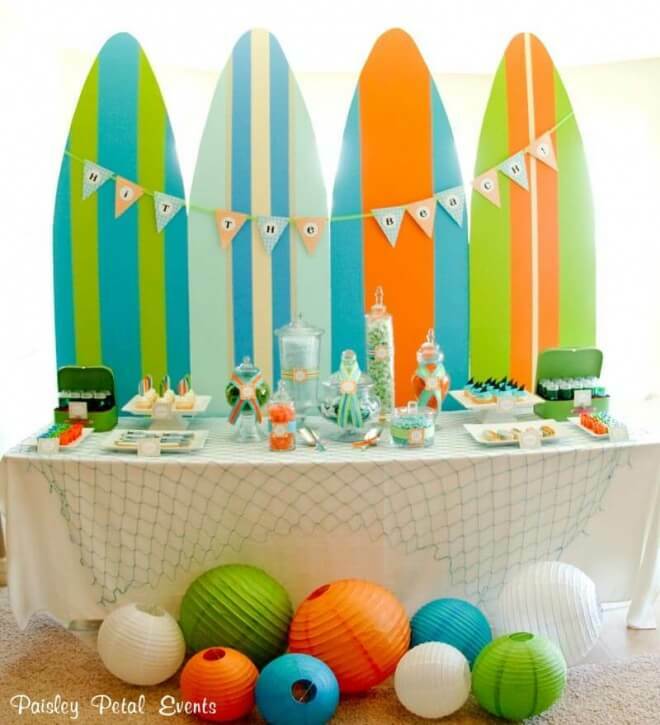 Surfboard decorations, paired with an adorable dessert table, made this one totally tubular surfing party! Get inspired for beach-y fun with this boy-girl siblings beautiful beach party. 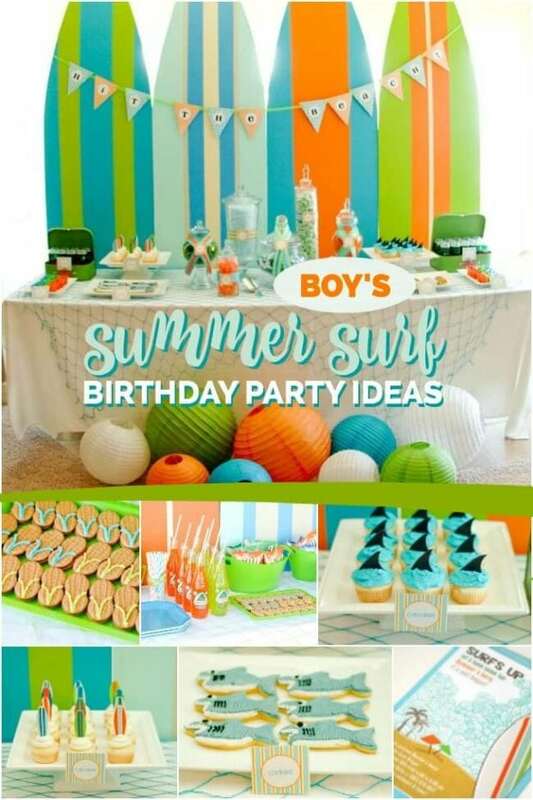 There are great ideas—like the sugar shack—in this boy’s surfing birthday party. Laura Sheneman captured photos of all the awesome ideas. When you think of summer, do you think of the beach? Holly does. That thought, combined with her son’s love of sharks, resulted in the surfing party ideas. 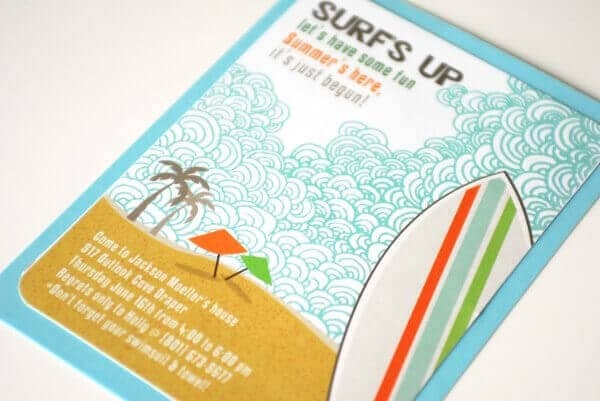 After discovering the perfect invitation, the surf theme started to take shape. 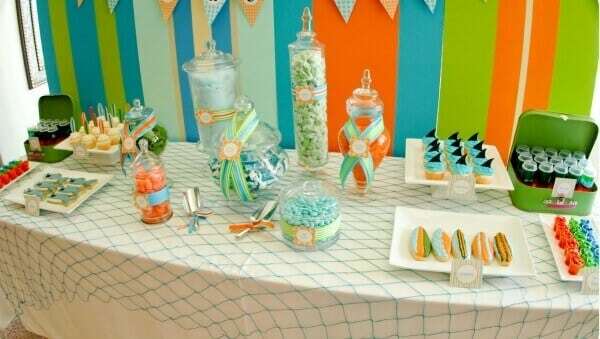 Holly set to work on the dessert table design. She and her husband dreamed up the concept of creating 8’ tall surfboards from plywood, using their jigsaw and painting them in party colors. She kept this more budget-friendly by using paint from the “reject” cart at her local home improvement store. Lined up side-by-side, the surfboards made quite an eye-catching display! Holly created a “Hit the Beach” banner out of scrapbook paper and strung it from the backdrop. A crisp white tablecloth was partnered with a blue fish netting overlay to bring in that beachy vibe. Paper lanterns in various sizes and coordinating colors were arranged on the floor by the table—don’t they resemble beach balls? 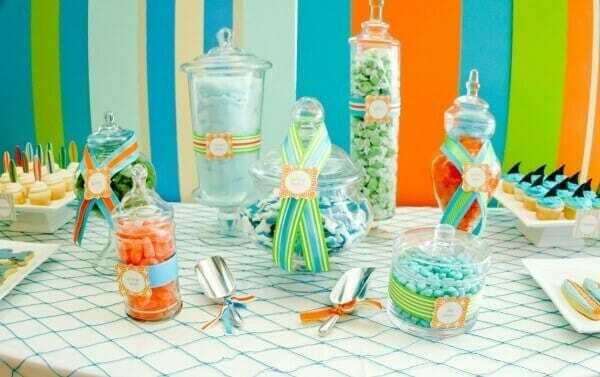 Apothecary jars were filled with color-coordinating candy. 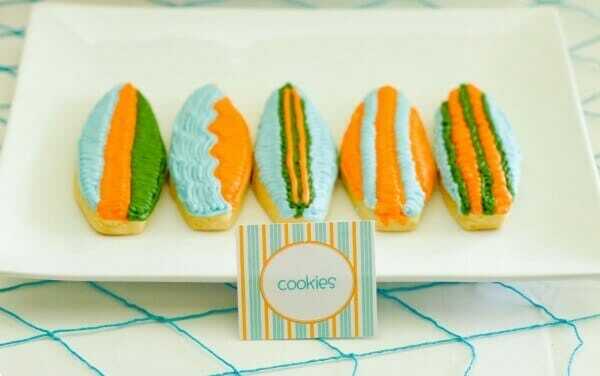 Striped ribbon dressed them up for the party. 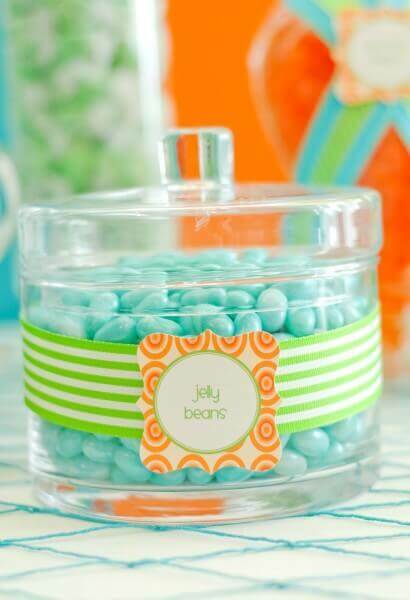 Guests could choose from gummy sharks, orange slices, peach gummy bears, cotton candy, licorice, taffy and jelly beans. The kids were invited to fill treat bags with their favorite candy picks from the dessert table. 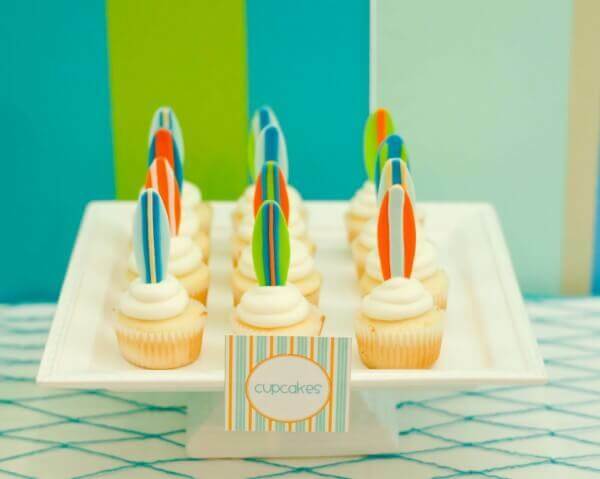 In addition to the ocean of candy, there were plenty of cupcakes and desserts creating a mouthwatering display of yummy goodness that I’m sure wasn’t left untouched for long! 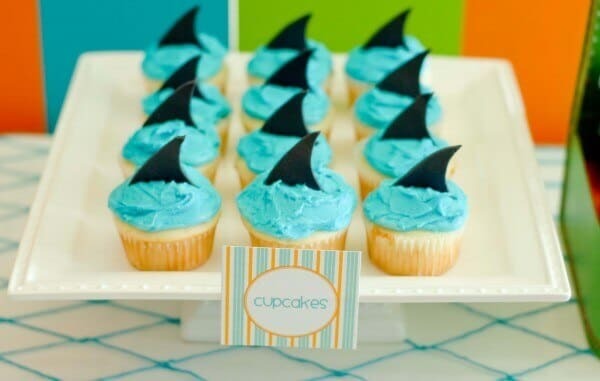 Sprinklebelle Cakes baked awesome fondant surfboard and shark topped cupcakes. 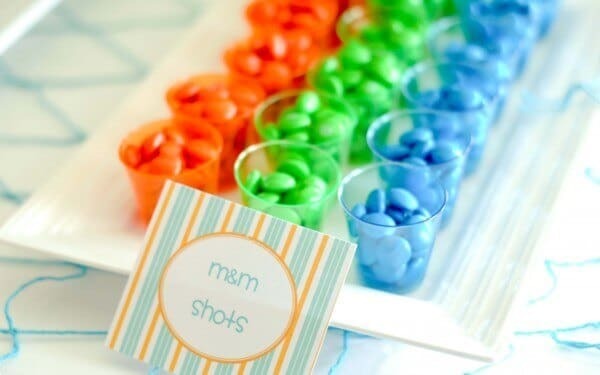 Shot glasses in party colors were filled with colorful M&Ms, which guests loved! 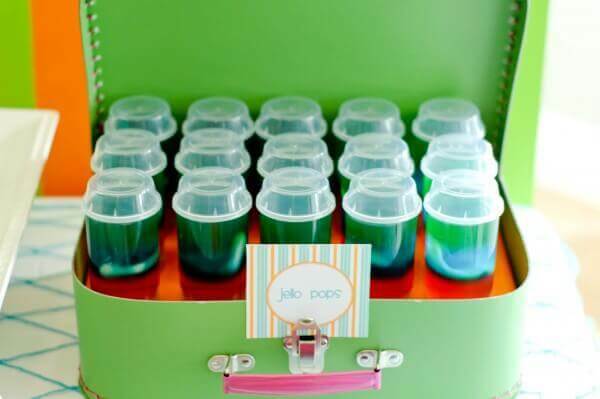 With push pops being trendy, Holly layered Jell-O in shades of orange, green and blue and added a gummy shark “swimming” in the blue layer. I love how Holly chose to layer them in a cute green paper suitcase. 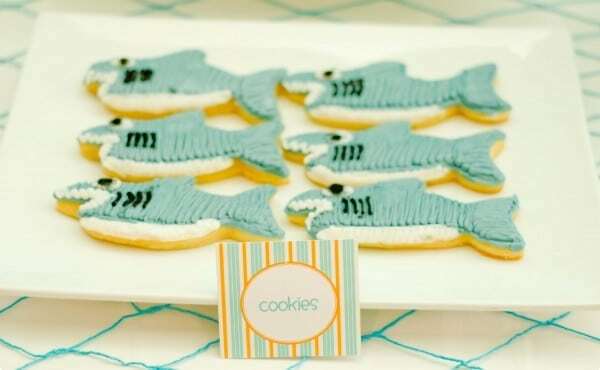 Shark and surfboard sugar cookies with buttercream frosting added a final tempting dessert option. Another small food table was decked out in surf-inspired décor to hold the main dish menu items: hot dogs, fruit, chips, drinks and super-cute Nutter Butter flip-flop cookies. Despite a windy day, guests played outside with water guns, raced on the Slip-n-Slide and bombed each other with water balloons. Two thumbs up from one beach lover to another! This party looks like so much fun! 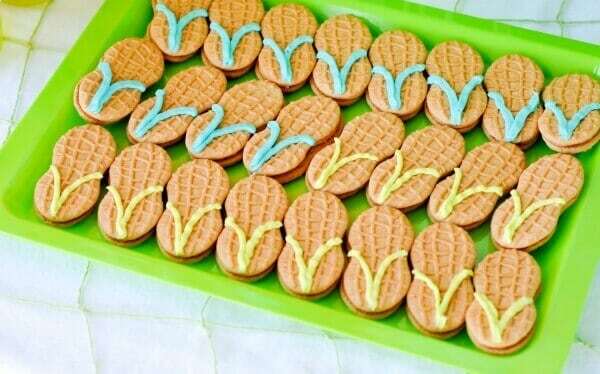 Don’t miss these awesome party ideas, full of inspiration!